RICHMOND, Vt.— Four years into a wildlife disease epidemic that has already killed more than a million bats in the eastern United States, the federal government today finally released a national response plan for white-nose syndrome. But the U.S. Fish and Wildlife Service’s plan is still only in draft form and only provides a conceptual framework for responding to the disease. It lists no specific action items and makes no concrete recommendations for research and management of the fast-spreading malady that has hit nine bat species so far, including two on the endangered species list. White-nose syndrome is associated with a newly identified fungal species that grows on bats’ noses and wings and causes them to die of starvation during the winter. From its epicenter near Albany, NY, the disease has spread rapidly, with the fungus now found on bats in 14 states, from New Hampshire to Oklahoma, as well as the Canadian provinces of Quebec and Ontario. Bats play a vital role around the country in controlling moths, beetles and other insects. The national plan has been long awaited by wildlife agencies and conservation groups as a way to push response to the disease into higher gear. Already, some bat populations in eastern states have declined by as much as 80 to 100 percent, and scientists fear that as the disease spreads westward, it will eliminate entire species of the insect-eating mammals. Insect populations may take off as a result, biologists say. The Fish and Wildlife Service is accepting public comments on the draft plan for the next 60 days. After that, it will review the public response and finalize the plan. Specific measures for addressing the bat disease will be contained in a subsequent implementation plan, but there is no deadline for completion of the implementation plan, according to Fish and Wildlife Service officials. The Center filed a petition earlier this year to close all federally owned bat caves in the lower 48 states to protect bats from the possible human-caused spread of the white-nose fungus. Since then, the Forest Service has declared all bat caves in its Rocky Mountain Region (Kansas, Nebraska, Colorado and most of Wyoming and South Dakota) off-limits to recreational use; the Bureau of Land Management advised its state directors to take precautionary measures against the disease, including targeted cave closures; and the Fish and Wildlife Service administratively closed all bat caves and mines within the national wildlife refuge system. Last year, the Forest Service closed bat caves to recreational use in eastern and southern national forests. The Fish and Wildlife Service has yet to act on a Center petition, filed last January, to list two white-nose-affected bat species under the federal Endangered Species Act, despite clear evidence that bat numbers have declined dramatically in the East, where white-nose syndrome has been present the longest. New project marries art and social responsibility. Working Proof Each week a new print is paired with a charity of the artist’s choice, to which The Working Proof donates 15% of the sale of each print, creating a product with not just aesthetic, but social value. This week the Charity of choice is Show Hope. The interest of The Working Proof is to promote a variety of charities and expose them to new supporters through the appreciation of art and creativity. Each week a new print is released once a week on Tuesday’s at 1:30 pm. EST. Autumn Poppy, by Natalie Tweedie. 15% of each print sale will be donated to Show Hope. $60. 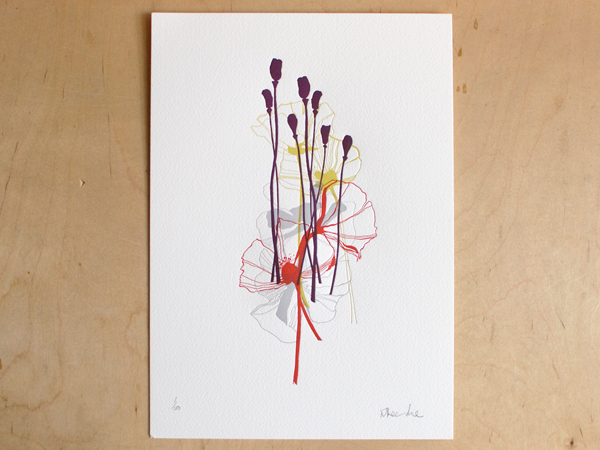 This is a four-color letterpress print on 300gsm Somerset Rough 100% cotton paper. Each print was signed and numbered by the artist. I chose to pair my print with Show Hope. We are so lucky to have our daughter Astrid in our lives. She brings us so much joy that it seemed logical to select Show Hope as my charity. When something brings a smile to your face…it’s good. When that something is an absolutely functional product, well, that’s even better! Unique, hand carved and hand painted wood birdhouses will do just that. Fabulously funny designs to make you smile, while providing real nesting sites for wild birds. Serving as excellent roosting spots too, these wood birdhouses will entice feathered friends from frigid or inclement weather, and offer crucial protection from predators. Now I ask: What better place to roost on a cold winter night than in the cozy belly of a fun cat or dog birdhouse? Complete with trap doors or twist-off bases, yearly clean out is a breeze with these fun wood birdhouses. The wood also allows for proper ventilation inside the house to keep birds comfortable in their digs. 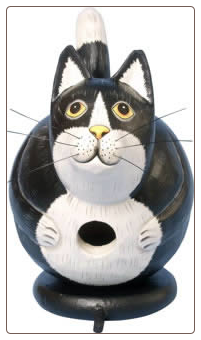 Available in expressive cats, dogs, favorite songbirds, silver airstream trailers, and even holiday snowmen and santas, you’ll find the perfect themed wood birdhouse to please anyone on your list… and for any occasion too. Check’em out, even if just to crack a smile! Birdhouses that are meant for feather friends don’t necessarily have to be boring wooden nest boxes. There are totally fun decorative bird houses with functionality that will also entice wild birds to roost, as well as, nest and raise their young. In every possible theme imaginable to man, and various materials like wood, resin, vinyl, glass, copper and more, the choices are quite abundant! However, there are a few basic requirements to be considered when choosing decorative bird houses. First, think about who it is you are looking to attract? Then consider the factors below, including the actual entrance diameter of your decorative birdhouse. Clean-out is a must for our avian friends, because birds will not build a nest in a house containing an old one. Dormant, old nests become dusty, invite parasites, and possible predators. When removing old nests, be sure to dispose of them a good distance from the birdhouse – just for this reason alone. And best to wear some rubber gloves too. Proper ventilation and drainage is also important for a healthy birdhouse environment. Air circulation helps prevent molds and bacteria from forming on the walls and floor. Good drainage in a birdhouse prevents any water build up and puddling that may occur. Proportional sized entrance is also a major factor. 2-1/2″ for Purple Martins, Flickers, Red Headed and Hairy Woodpeckers. As always, be sure to provide a consistent fresh water source for birds. Whether a pond, hanging bath, fountain, or pedestal type birdbath, it is the absolute best method to entice more feathered friends to your yard…and keep them coming back! When It Comes to Pet Trivia, Do You Know Jack (Russell)? 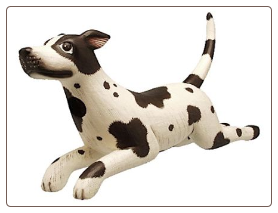 · Frasier’s Eddie, PBS’ Wishbone, and Nipper the famous RCA icon were all Jack Russell terriers. · Teddy Roosevelt’s dog, Pete, was known for having ripped off a French ambassador’s pants at the White House. 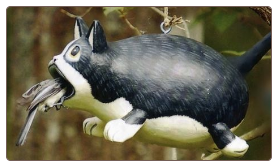 · A high-pitched dog whistle at the end of the Beatles’ song A Day in the Life is said to have been recorded by Paul McCartney for his sheepdog. · The Wizard of Oz’s Toto was played by a female cairn terrier named Terry. · “No Animals Were Harmed”® isn’t just a saying — it’s a trademark of American Humane Association, which monitors animal safety on the sets of movies, TV shows, commercials and music videos. How’d you do? Now is your chance to really prove your pet trivia prowess! Enter the Pet Trivia Contest at www.americanhumane.org/smarter and you could win a prize package of fun stuff from American Humane Association and Are You Smarter Than a 5th Grader?. American Humane Association recently monitored the use of animals on Are You Smarter Than a 5th Grader’s Pet Lovers Week, set to air in syndication from Oct. 25 to 29. Check your local listing for broadcast times in your area. The timing of the event coincides perfectly with October’s Adopt-A-Dog Month, a nationally recognized event by American Humane Association that encourages people to help reduce pet overpopulation by adopting their next canine companion from an animal shelter or breed-rescue group. Celebrating its 70th anniversary this year, American Humane Association’s Film & Television Unit is the leading authority on the safe use of animals in film. American Humane Association is the only animal welfare organization in the world with on-set jurisdiction from the Screen Actors Guild to supervise the use of animals. American Humane Association is also the only organization with the authority to issue the renowned “No Animals Were Harmed” end-credit disclaimer. For more information about American Humane Association and its Film & Television Unit, please visit www.americanhumane.org/film. To browse a listing of movies awarded American Humane Association’s “No Animals Were Harmed” end-credit disclaimer, as well as films that received other ratings, and for an explanation of how the animal action was achieved, visit http://www.americanhumane.org/protecting-animals/programs/no-animals-were-harmed/recently-released-movies.html. Since 1877, the historic American Humane Association has been at the forefront of every major advancement in protecting children, pets and farm animals from abuse and neglect. Today the organization is also leading the way in understanding human-animal interaction and its role in society. As the nation’s voice for the protection of children and animals, American Humane Association reaches millions of people every day through groundbreaking research, education, training and services that span a wide network of organizations, agencies and businesses. Visit American Humane Association at www.americanhumane.org today. From Mark Burnett, “Are You Smarter Than A 5th Grader?” is an atypical game show that measures adults’ lack of knowledge – as revealed by how much they’ve forgotten since grammar school. Jeff Foxworthy hosts the syndicated half hour (check local listings) as grownups find themselves in a classroom setting, revisiting their youth, as they tackle subjects they were taught years ago ranging from art to geography and math to social studies. In the classroom this season, country music superstars, Joan Rivers, Real Housewife Bethenny Frankel, Bill Engvall, Adam Corolla, the Ringling Brothers & Barnum & Bailey Circus performers, and the Harlem Globetrotters are among the special guests playing for charity. Plus special themed weeks including Cheer Week, College Week, We’re Smarter Than Our Boss Week, Moms-to-be Week, Lifeguard Week, and Pet Lovers Week. There’s something to be said for classic, architectural styling. Its elegant and clean lines are timeless, in any area of design or structure. These gorgeous birdhouses and feeders are styled in just that fashion. Sure, there are lots of houses and feeders with architectural styling, so what is it that makes these birdhouses unique? They’re hand crafted in durable vinyl/PVC. This means little to no maintenance at all…simply wipe with a sponge or damp cloth every other year! It’s the same vinyl used in the construction of houses for vinyl siding, virtually a maintenance-free, durable material that lasts for many years – even a lifetime. 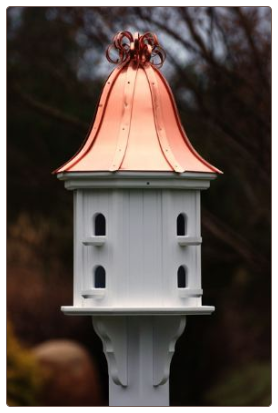 These unique birdhouses are made to order, so there’s always a choice of bright copper or patina copper roof. Some models are even available with durable cedar-shake roofs. Also with copper portals or perches, you can almost “build your own” unique birdhouse with the many choices available. 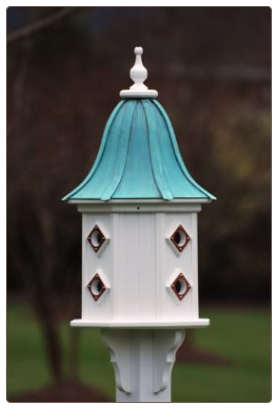 From smaller Bluebird Houses to stately Purple Martin Houses, the roof lines are available in slope, bell and curly copper variations, and from one to twelve individual compartments or nest spots. It can really be a difficult decision! Unique birdhouses make wonderful gifts for any nature lover, and for any occasion. They’ll be appreciated, and will actually be enjoyed by the recipient and their feathered friends alike….for many seasons to come! On October 2nd and continuing throughout the month, people in hundreds of communities in all 50 U.S. states and more than a dozen other countries will host a wide range of creative events in honor of the 28th annual observance of World Farm Animals Day (www.WFAD.org). From a somber candlelight vigil at a Petaluma (CA) slaughterhouse to a hopeful celebration of peace for ALL beings at a Hawaiian peace center, people around the world are remembering the animals. While many participate in scores of public marches, dramatic demonstrations, thoughtful classroom discussions, leafleting, and video screenings, others are raising awareness during personal events such as weddings and family gatherings. The World Farm Animals Day campaign is dedicated to exposing, memorializing, and mitigating the daily terror inflicted on more than 58 billion cows, pigs, chickens, and other sentient land animals in the world’s animal farms and slaughterhouses. The date celebrates Gandhi’s birthday. This year’s theme, “Holding Animal Agribusiness Accountable,” focuses attention on the meat and dairy industries’ “dirty secrets” – violations of human and animal rights, worker and consumer safety standards, and environmental protection laws, as well as the manipulation of government, public interest institutions, and everyday consumers (www.AnimalAgribusiness.com). In Washington (DC), campaign events started early with a dramatic banner display during a recent Congressional hearing on the massive egg recall. On October 2nd, activists in DC are distributing vegan food and information to thousands of people attending the One Nation Working Together peace rally. Next week, DC activists are picketing the National Chicken Council’s annual conference. Thousands of visitors are expected at vegetarian festivals in San Francisco, Orlando, Tampa Bay, and several Ontario locations. Attractions include live music, delicious vegan food, speakers, and special activities for kids. More than seventy-five communities are hosting walks for animals. Thirty universities are having educational events ranging from video screenings to street theater. A number of health food stores, yoga studios, animal sanctuaries, libraries, and artists are distributing free vegan information. The observations take place internationally. Among the London events are the first National March for Farmed Animals and an artist’s photography exhibit of intimate portraits of farmed animals. The Czech Republic is hosting a march and funeral ceremony, complete with a coffin and displays of factory farms. Two dozen events are planned in Canada, including marches, video screenings, and street theater. Other participating countries include Australia, Brazil, Chile, Croatia, Greece, India, Israel, Nigeria, Taiwan, Tanzania, and Uganda. Hundreds of bus display cards exposing the “dirty secrets” of animal agribusiness are going up in six major U.S. cities. Compelling television ads with a similar theme are airing through DISH Network and letters carrying the message of compassion have been sent to more than 600 newspaper editors. The World Farm Animals Day campaign has been coordinated since 1983 by Farm Animal Rights Movement (FARM) (www.farmusa.org), a nonprofit public interest organization working to end the use of animals for food. Local animal and consumer protection activists arrange events in their communities. So folks are doing the wave? It seems the contagious wave has also found its way to bird feeders! 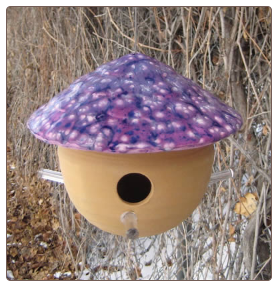 These very cool ceramic bird feeders are hand crafted in the most vibrant of colors. Ceramic means they’ll never fade and are virtually chew-proof to squirrels too. 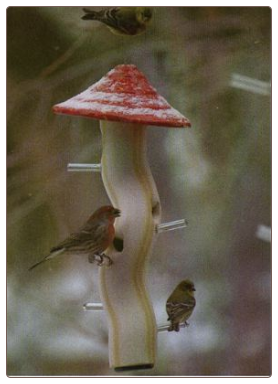 This tube bird feeder is a work of art with its natural form and earth tone tube. The design just lends itself well to nature and is guaranteed to compliment any landscape or garden. The overhang roof helps to protect seed from weather, and the perches are constructed of durable acrylic. Birds love them! Also available in a gourd shape, you could say it’s a variation on the tube bird feeder. 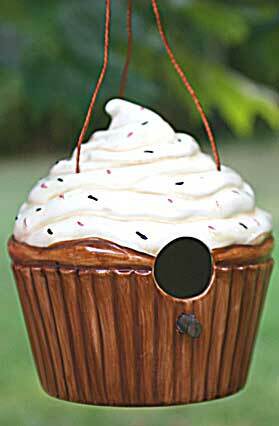 These unique bird feeders are totally fun and functional, and meant for feathered friends. They make great, long lasting gifts for any occasion, and gifts that will actually be used and enjoyed by the recipient. You can never go wrong with gifts approved by Mother Nature! As unsightly as it is, ground waste from bird feeders may also be hazardous to birds’ general health. As seed accumulates on the ground, mold and fungus begin to breed, and bacteria forms which can easily spread among local bird populations. Of course weather will affect this process, depending on heat, humidity and rainfall. Not only protecting the ground below from waste, and sprouting weeds, the newer seed catchers serve a multi-purpose function. Large, platform type areas catch fallen seed that is appealing to other birds who may not use the actual feeder. There is an additional feeding space at play here, allowing you to entice and attract more feathered friends. 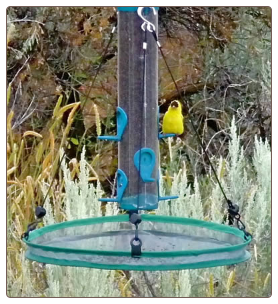 This large recycled plastic seed tray, or seed catcher, is fashioned for larger bird feeders that are mounted on 4×4 posts. Its innovative design really fills a need for these types of feeders. Recycled plastic means it will never crack, split, or warp, so it’s virtually indestructible. Screens lift out for easy cleaning too. The new Seed Hoops are another brilliant idea in seed catchers. 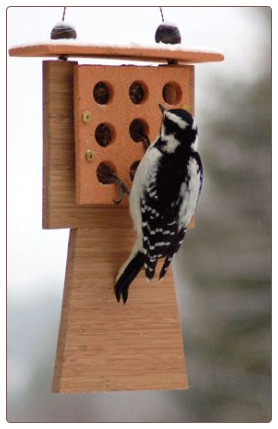 They’re adjustable to fit any hanging bird feeder, including tube feeders. 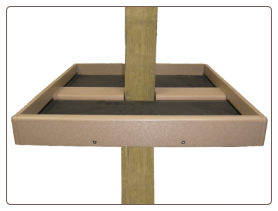 Available in a 16 and a super 30-inch diameter, they’ll eliminate ground waste from any feeder, while creating additional feeding space for new visitors.